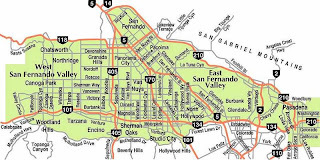 This map was retrieved from the site located at http://www.san-fernando-valley-ca-real-estate.com/San-Fernando-Valley-Map from the real estate site payed for by Prudential California Realty. 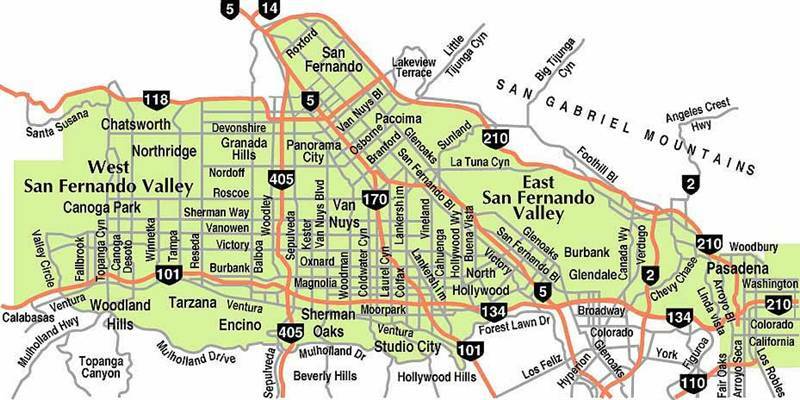 The map shows the San Fernando Valley, one of the regions of the Los Angeles County. It presents the major freeways that run through the valley, including the I-405, the I-5, Highway 101, etc. It is interesting to see that major streets run parallel with the major freeways that run near them. The streets in the city of Pacoima run parallel to the I-5 while the streets in Canoga Park run North to South with respect to the 101 Highway. This picture is taken from the USGS website at http://vulcan.wr.usgs.gov/LivingWith/VolcanicPast/Places/volcanic_past_rocky_mountains.html. The map identifies the Rocky Mountains that run from Washington all the way down to New Mexico. The map is easy to read because it is evident that it is a map of the United States and the the orange coloring is the mountain range. It is interesting because this map it gives us an insight as to how large of a mountain range the Rocky Mountains really are as they take up a big portion of the western U.S. This image was taken from the site called Science Clarified at http://www.scienceclarified.com/landforms/images/ueol_03_img0122.jpg. It is a map of all the volcanoes around the world and the plate boundaries. 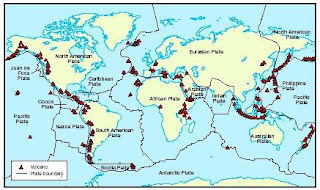 It is interesting because there seems to be a relation between the plate boundaries and the volcanoes. 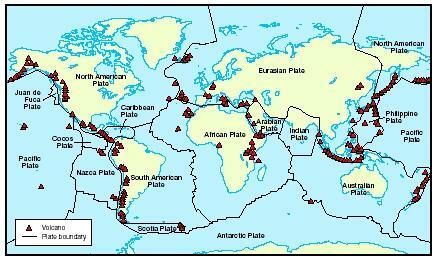 The relation is that most volcanoes, and thus volcanic eruptions, seem to occur by the plate boundaries.